Well, actually, only one of these truffles is a Halloween piece. But I didn't want to say "Halloween and others" or "Halloween and non-Halloween." So here we are: four truffles, one of which is a Halloween truffle. I do enjoy getting special seasonal or holiday selections. Most of the store chocolate, if anything, just gets a holiday-themed wrapper for a regular flavor. Chocolate shops like Zak's Chocolate, on the other hand, have the chance to throw in fun pieces like this. - Bloodshot Berry Bonbon - I say fun because even though a bloodshot eyeball sounds like it would fall into the gorey side of Halloween, this eye is actually rather cute. Perhaps I'm just admiring the paint job. A box of these would make a nice little gift (gifts aren't a standard Halloween tradition, but a gift is always in season), or you could put out a small plate of them at home on Halloween night. Perfect for everyone who just stays home for the holiday but still likes to bring in a couple of Halloween touches. 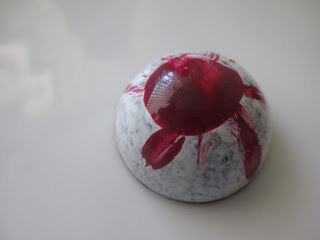 Now, as far as taste goes, you get a berry flavor from this truffle's ganache right away, then tangy chocolate, and then more of a semisweet chocolate flavor once the ganache has melted away and left you with just the chocolate shell. I'm not always the biggest on berries, so I can't say specifically what berries I taste; it seems like more of a general berry flavor to me, perhaps with some blackberry in there. It's somewhat tangier than I'd expected. Overall this is a simple, flavored truffle. - Cinnamon Plum - This one, visually, makes for a great companion to the Bloodshot eye: it also comes in a rounded shape, with some red, purple, and white painted on. And the cinnamon (and even the plum) makes for more of a fall type of flavor. You get that cinnamon flavor right away, followed quickly by the plum; the two together create that spiced fruit tone. The plum I would say is more of a general either spiced fruit or fruit-in-a-dessert flavor, not specifically recognizable as plum. It's the cinnamon that's the star and takes the most attention, in an absolutely warm and delightful way. Cinnamon is a wonderful spice and goes so well with chocolate and yet I don't feel like it gets used very often these days. The cinnamon here is nice and strong (properly, not overly, strong) to really give you that feeling of the holiday season. I taste this and instantly picture fireplaces and pine garlands and The Nutcracker and plum pudding in A Christmas Carol. - AZ Queen Bee Honey - The biggest of the four, this truffle is a sort of round, thick disc with scalloped edges and a yellow honeycomb pattern on top. The ganache here is a big firmer, almost chewy. While you do taste some chocolate first, it's that rich kind of creamy flavor belonging to honey that quickly takes over. Strongly, recognizably honey. I don't know that I've ever come across the honey flavor in chocolate being this strong--which is a compliment. If a chocolate is labeled as honey, then I want to taste the honey. And of course that would be where the different texture comes in: the ganache seems to be made largely of honey. That's why it has a texture like the thicker, creamed honeys, almost grainy like that; I approve since that type of honey is usually my favorite. This truffle is the perfect example of two flavors working together as one, the chocolate and the honey blending together and enhancing each other. Lovely. - Peixoto Mocha - A nice square with the coffee bean (shape) on top. Sleek-looking. I cut this one open (I can hardly even remember the last time I just bit into a truffle: I always have to be prepared to take pictures of the inside) to find a strong coffee scent. Naturally, then, this truffle tastes strongly of coffee right away--and yes, mocha specifically. It's like I can taste the coffee, the cream, and well, the chocolate--so I suppose this could be a cafe mocha, too. The strong and fresh coffee flavor will make this one a win for coffee-lovers. I think my favorite is the Cinnamon Plum because it transported me and made me feel warm and happy, then the Queen Bee because it's awesome. And the Bloodshot Berry Bonbon is just the thing for Halloween. When I was at the shop earlier in the week, they mentioned that they would also be putting out plain chocolate in Halloween shapes. So for everyone who isn't trick-or-treating, try stopping at a chocolate shop instead; it's just as fun.